To schedule a free basement upgrade quote, contact us by phone or e-mail today! Our experts serve throughout the British Columbia area, including Kamloops, Kelowna, Vernon and nearby. At BC Basement Systems, we've seen just about everything that can happen to a finished basement, and we've been called in to waterproof them daily. Once the basement is finished, repairing and waterproofing the space is much more expensive. The systems we install at BC Basement Systems also include an alarm system that sounds off in the unlikely event of a pump failure -- so you can respond right away. 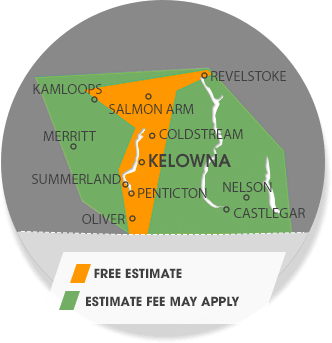 Our experts proudly provide free quotes to the British Columbia area, including Vernon, Kamloops, Kelowna, the surrounding areas of Nelson, Quesnel, Penticton, West Kelowna, Salmon Arm, Castlegar, Williams Lake, and nearby.